One word can sum up the way of life here in Kenya, RESPECT. 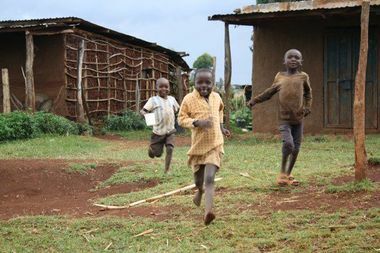 Before I went to sleep in my grass and mud hut that first night in Kenya, I asked if there was anyone who would like to get up and go running at 5:30am, and a 19-year-old guy Isaac said he would. As many of you know, I am training for back-too-back marathons in Nairobi and New York to raise awareness and money to help kids live healthy lives all over the world, so despite some serious jet lag, hitting the road was required. I really didn’t expect him to show up, but as I exited my hut that morning bright and early, there he was waiting for me. Eight grueling miles later, Isaac and I had pounded the hilly farm trails, full of uneven rock and dirt and I realized that training in altitude was going to be a lot harder than I expected. Here’s the thing though, I have always had company on my runs. At one point that first morning, I fell down on loose dirt and this little kid felt awful and tried to pick me up. 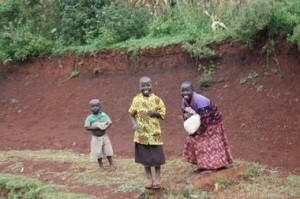 I was laughing at myself – here’s a kid in Africa with no shoes worried about the big white Muzungu. Along the way we increased in numbers as kid after kid joined in running. Many of them were on their way to school, and most had a uniform on,but still no shoes. It was a site to see. After that morning’s run my legs and lungs were hurting and as I sat finding something like breath, up came the manager of the huts, Edward. Skinny, thoughtful, around 40, Edward grew up as a poor farmer working to raise money for his education. He spent years in Qatar as a bus driver, sending the money home to his wife and four kids. Edward, a specialist in sustainability made sure I ate breakfast that morning – eggs and Chai tea. He has taken me under his wing and treated me like his own family every day since that first very delicious breakfast. So here I am, running and training in Kenya for a marathon. It’s kind of a dream right? 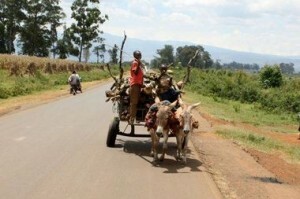 Running with Kenyans? I didn’t wear my GPS watch for the first week and Issac kept our distances a bit ambiguous. Either I was running REALLY SLOW or we were going a lot further than he admitted, but it was one of the best ways to really see this gorgeous country. In the US we often think of working as something you HAVE to do, but the kids here literally just join and run along for fun. It’s amazing – and they run for a really long time. 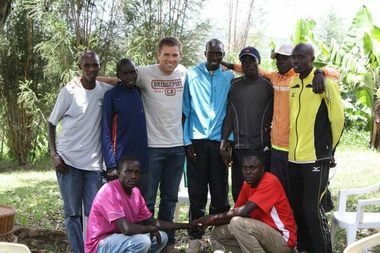 So where are all these kids – my Kenyan running coaches – coming from? Empowering Lives International established the Children’s School right near the Chebaiywa Clinic in 2006 with 96 orphans across the grades of K through 8. 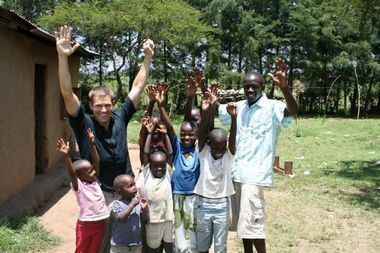 With funding from the church and land near Eldoret, they built residences and the school, and then set out to find legitimate orphans in the community that needed help. Communities had to submit death certificates for the child’s parents and their birth certificates, as well as have interviews done in the community to verify. The 96 children chosen were divided up into 4 “families” of 24 and they live together, go to school together, worship together, and each family has a mother and father who take care of them. Interacting with these children all the way from age 1-14, I was blown away by their manners, their intelligence, and their will to succeed. Their English is impeccable. I spent almost an hour talking to a 13-year-old boy about human physiology, and also World War II history. Astonishing. These orphans would have had no opportunity, health, education, or devotion and because of Children’s Home they are emerging as successful, bright young men and women. In the U.S. with the childhood obesity epidemic, we try everything imaginable to get kids to move and be active. What I witnessed at the primary school, made me smile. I even got a video of it. KIDS running and smiling – all of them – and not by any prodding or bribing or threat of discipline. 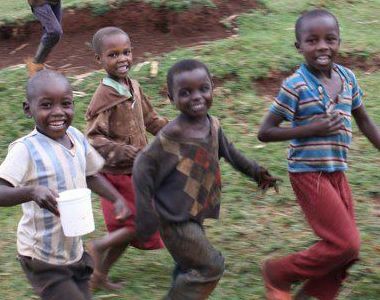 When the children had their classroom break mid-morning and had time to get their porridge and chai, and then to come back, they ran both ways, in their uniforms, and with sandals/bare feet. Astonishing – again – astonishing. There is absolutely something we can learn from them! I told the head teacher how this would rarely happen in America, and he looked at me confused and cockeyed and said “really?”. That evening I was invited to participate in the “Devotions” at Children’s School and to take supper with them. 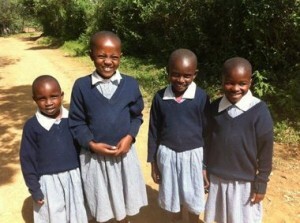 They welcomed me with extended hands and hearts and I stood up and said a few words in Swahili. Devotions are collective singing and then hearing a lesson from the bible. It was the most beautiful thing hearing all of these children young and old singing together. So here’s something I have learned training for a marathon in Kenya with little kids: it doesn’t matter how much you have, love of activity and respect for others can be taught if you take the time to focus on it. These children, who all have lost so much, still approach life with love, respect, kindness, and joy. Shaking of hands, greetings, making people feel welcome, sharing meals, praying for others. I think this must be a way they have survived over time, in their tribes, and further strengthened by the values taught in bible. It is perhaps this respect for others that has let this community endure some of the darkest days. We would love for you to share your insightful thoughts in the comment section below. U.S. Navy Lieutenant Commander Andrew Baldwin, M.D. is a physician, humanitarian, U.S. Navy diver and media personality currently serving as a family medicine resident at the Naval Hospital Camp Pendleton in Southern California. Dr. Baldwin assisted the U.S. Surgeon General with a program called Healthy Youth for a Healthy Future and currently serves as an advocate for the Let’s Move Campaign, headed by First Lady Michelle Obama. Both of these programs target childhood overweight and obesity. 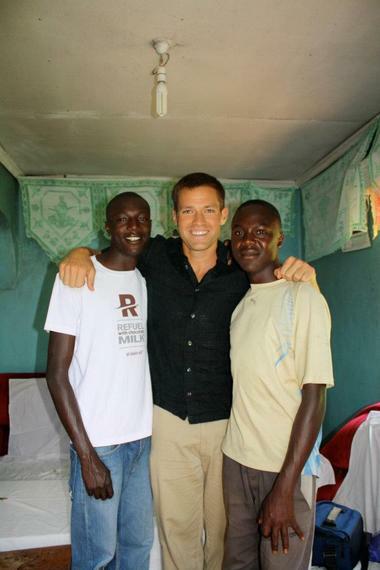 Dr. Baldwin is active in charitable and humanitarian efforts. He is founder of the Got Your Back Network, a 501(c)(3) foundation that provides an avenue for the children of fallen soldiers to learn and be inspired by the most successful leaders of our generation.